Our head baker Melinda Champagne makes one of the most delicious pecan pies we've ever tasted. This recipe is an excerpt from our cookbook Feel Good Food, and we're happy to share it with you to help make your holidays even more special. Melinda Champagne has been our baker at Bistro-to-Go since we opened in 2007 and previously worked for us at Blue Mountain Bistro restaurant as well. You can imagine how much we appreciate it when she shares a special recipe with us. And our customers do, too. This recipe of hers is especially delicious, and come spring she spices it up with chocolate chips and transforms it into a Derby Pie for the Kentucky Derby. If you have to bring one pie to a friend's house for this special holiday, or just want to impress your family and friends with any time of year, give this one a try. In a bowl, mix together eggs, sugar, corn syrup, melted butter, bourbon, and salt. Stir until thoroughly blended. 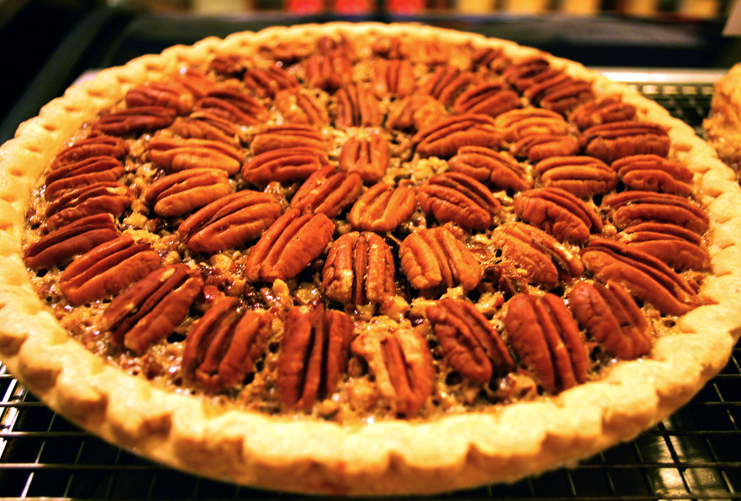 Arrange pecans in the prebaked pie crust in an even layer and cover with filling. Whole pecan halves certainly look nice, but for my money, the pecan pieces make a better pie as I find the halves make it difficult to cut nice neat slices. Place pie on a sheet tray and bake 40-45 minutes; check at 35 minutes, and if it seems too loose, let it bake another 5–10 minutes. The outer edges should not get overbaked. Remove from the oven and let cool a minimum of 30 minutes before serving; better yet, make it a day ahead. Cover but do not refrigerate.